Latino Protestantism is growing rapidly in the United States. Researchers estimate that by 2030 half of all Latinos in America will be Protestant. This remarkable growth is not just about numbers. The rise of Latino Protestants will impact the changing nature of American politics, economics, and religion. Latino Protestants in America takes readers inside the numbers to highlight the many reasons Latino Protestants are growing as well as the diversity of this group. The book brings together the best existing scholarship on this group with original research to offer a nuanced picture of Latino Protestants in America, from worship practices to political engagement. The narrative helps readers move beyond misconceptions about Latino religion and offers a window into the diverse ways that religion plays out in real life. Latino Protestants in America is an essential resource for anyone interested in the beliefs and practices of this group, as well as the implications for its growth and areas for further study. Mulder, professor of sociology at Calvin College; Ramos, assistant professor of sociology at George Fox University; and Marti, professor of sociology at Davidson College, have teamed up as part of the Latino Protestant Congregation Project, a joint endeavor of Davidson College and Calvin College, to create this cooperative study. By 2030, they write, it is estimated that half of all Latinos in the United States—who currently make up 17% of the population—will be Protestant. The ‘Latino Reformation,’ as Time named it, has remained largely invisible to the general public, fellow Protestants, and social scientists, in part because few dedicated researchers speak Spanish. But now the Latino Protestant Congregation Project has released its initial substantive and complex findings, examining styles of worship, values, congregation demographics, leadership structures, and sociopolitical perspectives. The fine mix of fresh quantitative data and engaging qualitative case studies gives a rich feel for the diversity of Latino Protestant communities, from a Dutch-Latino Reformed church in Iowa to the non-denominational church in Los Angeles that encourages members to ‘transcend’ ethnicity. Additionally, the chapter on Latino Protestants’ political and social engagement is required reading for anyone interested in likely Latino voting patterns in 2018 and beyond. An ambitious, comprehensive, and nuanced exploration of Latino Protestantism in the United States, this book draws on survey data and extensive qualitative fieldwork to demonstrate the variety of Latino Protestant identities and communities. This book is a must-read for anyone who wants to understand this fast-growing portion of the American religious landscape and how it is reconfiguring the American Latino community. 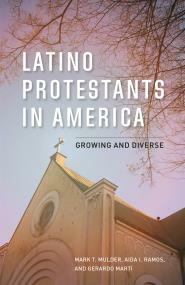 Weaving together a rich array of sources, these authors demonstrate that Protestant churches in the United States function as increasingly important sites for the production of Latino identity, even as they show that this identity cannot be reduced to any singular definition. In its extensive reach across the country and through its interdisciplinary approach, Latino Protestants in America captures the nuances of religious faith as an everyday practice that also has the power to redefine the political and economic forces that shape our lives. Growing, diverse, and little understood—Latino Protestants receive here a thorough and much-needed examination. Drawing together existing historical, survey, and ethnographic data, the authors add systematic new observations from a team of research fellows. The result is a book that will be the go-to reference in the years ahead. In this landmark study, the authors unpack the complexity of Latino Protestants, drawing on a variety of empirical studies, including surveys and ethnographic description. The book makes a major contribution to our understanding of the changing face of Protestantism, the conversion of Latinos from Catholicism, and the demographics of immigrants from Latin America. Mark T. Mulder is professor of sociology at Calvin College and co-director of the Latino Protestant Congregations Project. He is author of Shades of White Flight: Evangelical Congregations and Urban Departure and numerous articles. His writing has won awards from the Evangelical Press Association and the Associated Church Press. Aida I. Ramos is assistant professor of sociology at George Fox University and research fellow with the Latino Protestant Congregations Project. She has published articles in a range of journals, including the Journal for the Scientific Study of Religion. Gerardo Martí is L. Richardson King Professor of Sociology at Davidson College and co-director of the Latino Protestant Congregations Project. He is the author of several articles and books, including Worship Across the Racial Divide: Religious Music and the Multiracial Congregation. He is currently editor in chief of the journal Sociology of Religion.